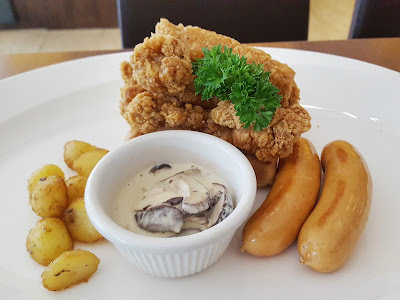 Okay, the new additions are not so new already for if you had visited Swensen's recently, you would have noticed quite a few additions to its menu since July 16. 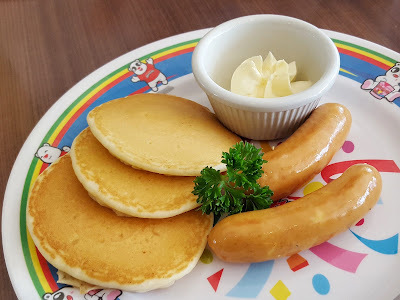 The missus and the kiddos popped by the restaurant about a week ago to try out their latest breakfast menu, which featured predominantly cheesy sausages that were obvious favourites with most kiddos. The cheesy sausages were awesome! One of the new dishes which they got to try, was the Salted Egg Lava Rolls ($10.80), consisting of 3 pieces of charcoal bread roll filled with salted egg butter cream, buttered potatoes and you guessed it, 2 cheesy sausages. 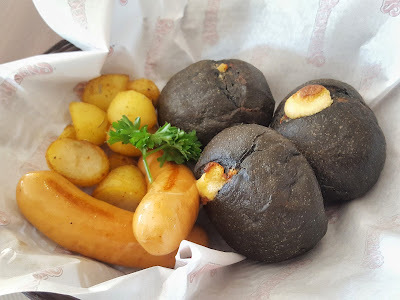 The missus said she actually enjoyed the bread roll much and that it tasted great, but the sauces were really too little. There must always be sufficient salted egg sauce to ooze out when you break the bun, no? Hope that Swensen's will take note of this shortcoming! 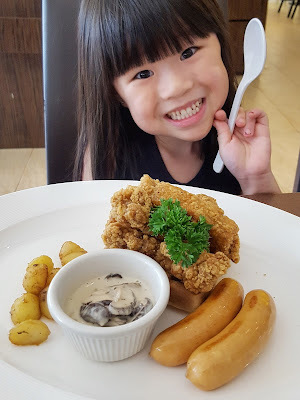 Then she told me that they also tried the Chicken N Waffle ($13.90) which Stacci liked. I mean, who would resist a piece of crispy fried chicken? I was looking through the photos she took of the dishes, but was unable to find the right one. Only when I took a third look did I notice the edges of the waffle underneath the big piece of chicken. I thought it was just a dish of chicken cutlet. The waffle was a typical classic, nothing to shout about. But having it with the butter lime dressing on the chicken, the missus described it as an unique and acceptable combination of sweetness, savouriness and tanginess. 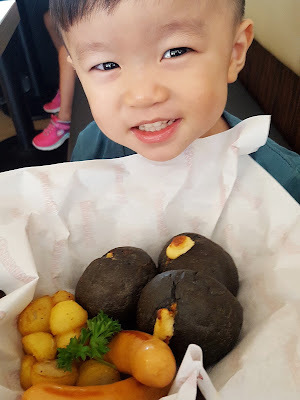 It comes with buttered potatoes and 2 cheesy sausages too. But that's no all, they even had the kid's meal named Simply Pancakes ($7.50) that is not exactly simply pancakes! This is because the vanilla buttermilk pancakes comes with 2 cheesy sausages too! No escaping these sausages I say. 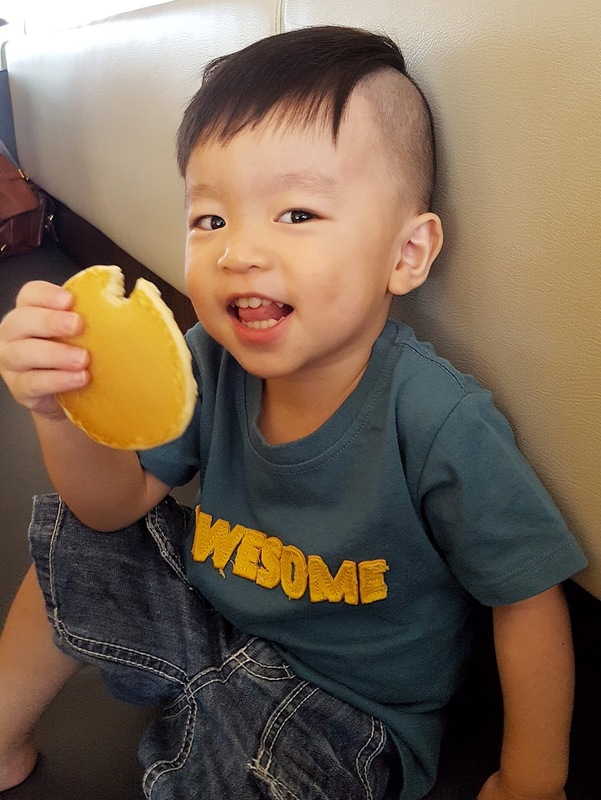 Oh the kid's set also comes with apple juice, orange juice or iced milo. As for adult's sets, they come with free coffee or tea. You may wish to check out their website for their new additions to their mains such as Teriyaki Salmon, Hawaiian Special, Seafood Arrabbiata Pasta and many others! Can you believe it, they even have Salty Eggy Creamy Sundae now? I think I need to try that soon as I am wondering how it would taste like! 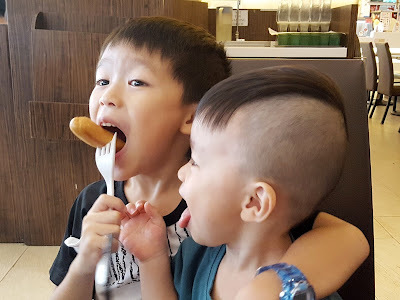 Thank you for inviting the family over Swensen's!